Gallup recently published a remarkable report on the attitudes of Muslims and non-Muslims regarding Islam in Europe. One of the most striking points in the report was that 80% of French Muslims believed that Muslims were loyal to France. But only 44% of their non-Muslim countrymen believed Muslims were loyal. The report, The Gallup Coexist Index 2009: A Global Study of Interfaith Relations, is the first annual report on the state of religious relations in nations around the world. The report contained some remarkable findings that show a troubling gap between how European Muslims see themselves, and what others assume about them. French Muslims, for example, identify with France as much as other French do (52%/55%), although they identify much more with their religion (58%) than the general French public (23%). So for French Muslims, their religion and their national loyalty are complementary, not mutually exclusive. But their religious identification makes their patriotism suspect to their neighbors. Similar results were noted in Germany, where 71% of German Muslims said Muslims were loyal to Germany, while only 39% of their neighbors trusted Muslim loyalty to the state. What makes this finding even more ironic is that 40% of German Muslims actively identify with Germany, while only 32% of the general German population did. So Muslims in Germany not only see themselves as more patriotic than others credit them for, they are more loyal to Germany than other Germans! In the United Kingdom, 82% of Muslims said British Muslims were loyal. Only 36% of their neighbors shared that view. But what is even more fascinating is that UK Muslims showed more faith in their country’s government than other Brits. 83% of British Muslims believed that their nation’s elections were fair, while only 57% of the general populace did. 76% of British Muslims believed in the integrity of the justice system, while only 55% of their neighbors trusted the courts. The wide gap between how Muslims see themselves and their patriotism, and how their neighbors perceive them, is dangerous and must be addressed. Unfortunately, the problem appears to lie less with the Muslim communities, who clearly love their countries, than with deep-rooted bigotry and social exclusion practiced by many of their neighbors. Muslims in many of these countries complain, with justification, that they are locked out of jobs and denied opportunities available to the rest of their countrymen. And in Britain, the economic result of this discrimination is very real. The poll showed that 62% of British respondents were employed, but only 38% of British Muslims held jobs. The poll’s results also suggest that radicalization among European Muslims is most likely to occur in environments where they are economically deprived or discriminated against. Not exactly a shocker. As an American Muslim, one of the greatest things I treasure about the United States is that economic opportunity is largely available to everyone, regardless of race or religion. The kind of overt class system that appears to be still be very much in place in Britain is anathema to American notions of entrepreneurialism and social mobility. Most Muslims I know are quite well educated and prosperous, with the usual joke being that American Muslims won’t settle for anything less than high-paying jobs as doctors, engineers and lawyers. I myself am a former attorney with three graduate degrees and have become a Hollywood screenwriter and producer for networks such as NBC and Showtime. Being a Muslim does not automatically create a glass ceiling in this society, and it is for that reason that most American Muslims are much better integrated than their European counterparts. Integration into foreign societies is actually a long-standing Muslim tradition that goes back to the birth of Islam itself. In my novel Mother of the Believers, I relate how the early Muslim community, including Prophet Muhammad’s daughter Ruqayyah, had to immigrate to the Christian country of Abyssinia to escape persecution in Arabia. Welcomed by the ruling Negus as fellow monotheists, the Muslims became an integral part of Abyssinian society, living in peace and trading with their Christian neighbors. When the pagan Arabs of Mecca sent envoys to the Negus demanding he deport the Muslim exiles, the king refused, citing Muslim love for Jesus Christ and the Virgin Mary. Muslims and Christians were brothers in the eyes of the Negus. This event is quite a remarkable moment in history, as one religion (Christianity) protected and defended another (Islam) from annihilation. And Muslims to this day look back fondly on the years of Abyssinian sanctuary, and the Christian Negus is considered a great hero by Muslim historians. In this ancient tale there is also a lesson for today. Integration is a two-way street. The Muslim immigrants became loyal and active participants in Abyssinian society because the Abyssinians were secure in their own identity and welcomed the newcomers. And Ethiopia, the modern descendant of the old Abyssinian kingdom, remains today a majority Christian nation with a large and integrated Muslim minority. Europeans must similarly change their attitudes toward their Muslim communities and welcome them as neighbors, not treat them as pariahs. These countries must end discrimination and provide their Muslim populations with equal opportunities that will further solidify their demonstrated loyalty and patriotism. There is much to learn from Gallup’s new report. But I hope that Europeans will begin the process of soul searching as to whether their fears of their Muslims neighbors are based in their own prejudices rather than in fact. European Muslims love their countries and want to integrate. It is now up to their host countries to welcome them into a new partnership that will be critical to the future of Europe and the world. This entry was posted on Thursday, May 14th, 2009 at 2:17 am	and is filed under World events. You can follow any responses to this entry through the RSS 2.0 feed. Both comments and pings are currently closed. I just finished Mother of the Believers and I thoroughly enjoyed it! As a Muslim woman, this was a fresh take on the history of Islam. 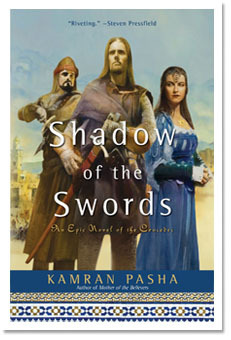 I was able to learn so much about the islamic history through this narrative. It is a must read book for anyone who wants to know about the Sahaba and the beautiful religion. Keep up the good work! I look forward to reading your next book.